While lions and hyenas are both very interesting animals, it seems that something interesting happens when it comes to the food chain. Recently a segment showing a large pack of Hyenas going after a wandering Lion has aired and it has shocked many. This segment being a clip from the newer BBC Earth series Dynasties. As things like this are happening more and more often we can blame ourselves. As BBC Earth reported our planet itself is changing at a very intense and quick rate and the habitat that they live in is constantly changing in ways most people would not truly understand. The series itself goes over five great families consisting of five different kinds of animals and all that come in contact with them in-between. For years and years, hyenas and lions have been competing with one another. Each one trying to protect their resources has even led to infanticide (the act of killing each others’ young). I guess you could call these two groups mortal enemies of one another as National Geographic has referred to them as such for quite some time now. While lions are stronger than hyenas when outnumbered the lion won’t stand much of a chance on his or her own. While the odds are against this majestic lion when he wanders away from his herd and into the midst of about 20 hyenas, somehow he remains strong for as long as is needed. 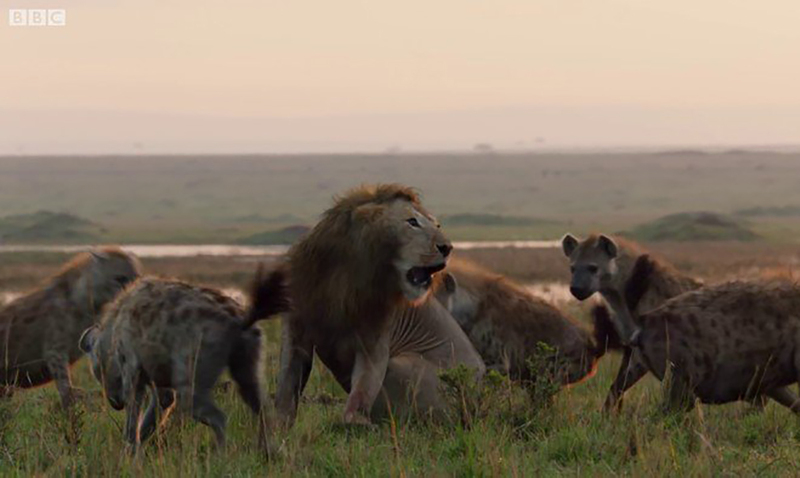 The hungry hyenas while ready to take things as far as needed to exhaust the lion and catch themselves a meal taunt him for as long as they possibly can. The brotherly bond this lion shared with his fellow herd-mates seemed to prove strong as he was saved in the nick of time. I could only imagine how he must have felt right in the middle of all of those hyenas. Trapped and unable to leave the situation, he was most likely quite horrified and scared for his life. Nature is truly terrifying in more ways than most people realize. If you’re not the kind of person who does well with this kind of thing don’t bother taking a look below but if you want to see the video have at it. While it is a bit heartbreaking, it is still quite fascinating to see. Isn’t it amazing how quickly things change once the other lion appears?